BUCHANAN, Mich. – The penultimate round of the Mtn. Dew ATV Motocross National Championship, sanctioned by AMA (ATVMX), ultimately resulted in the crowning of an AMA Pro ATV Champion on Saturday as defending two-time titleholder Chad Wienen cemented his status as one of the all-time greats by securing his third straight championship with one round remaining. 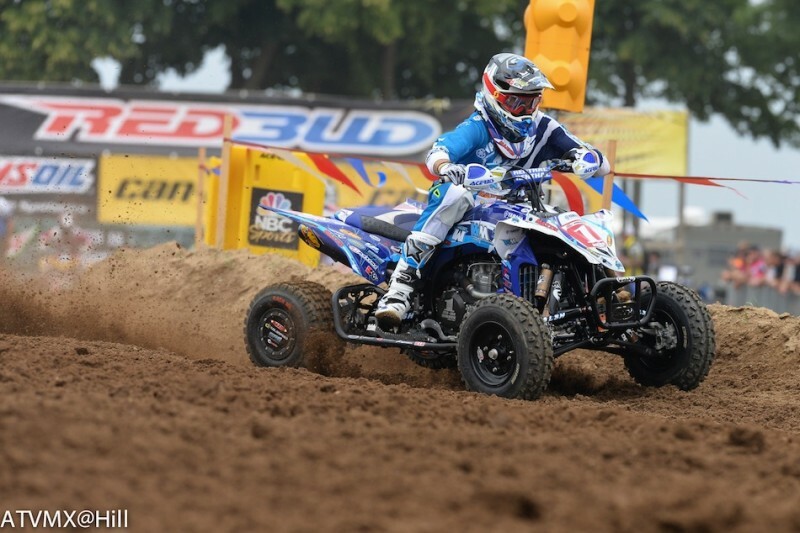 Wienen enjoyed a perfect day at RedBud aboard his Wienen Motorsports/SSi Decals/Walsh Yamaha, putting forth a dominant 1-1 outing en route to victory at the Rocky Mountain ATV/MC RedBud ATV National, his sixth of the season. Another balmy afternoon graced the series’ annual visit to Michigan, where Wienen’s championship quest began with him earning the ATVRiders.com Top Qualifier Award for the fifth time in eight rounds. As expected, the RedBud track gradually got rougher as the afternoon went on, providing a true challenge for the ATVMX elite. In the opening moto, Motosport.com/RRR/Ford/DWT/Walsh Honda’s John Natalie put himself in a familiar spot by capturing the SSi Decals Holeshot Award with Wienen in tow. Natalie would go on to lead the first lap, but Wienen put the pressure on quickly and made his move to the front of the field the following lap. With a clear track ahead of him, Wienen set sail and left Natalie in the clutches of a hard-charging Joel Hetrick aboard his JB Racing/DWT/Mtn. Dew Live Wire Can-Am. On Lap 3, Hetrick found some momentum coming out of the final corner, allowing him to slingshot past Natalie and take over second. From there, the top three remained status quo, with Wienen maintaining a three-second margin over Hetrick. As the checkers flew, Wienen, Hetrick and Natalie took the top three spots, with Wienen Motorsports/SSi Decals/Walsh Yamaha’s Thomas Brown solidly in fourth and BCS Performance Can-Am’s Josh Creamer in fifth. JB Racing/Cheerwine Can-Am’s Jeffrey Rastrelli made an impressive climb to come from 10th to sixth. With one big step towards the AMA Pro ATV crown completed, Wienen seized control of Moto 2 out of the gate, grabbing the SSi Decals Holeshot Award and essentially dashing any of the hopes of his fellow competitors. Baldwin Motorsports/PEP/Upperman Racing Honda’s Josh Upperman jumped out to a great start in second, with Natalie not far behind in third and Brown in fourth. After solid first motos both Hetrick and Creamer were forced to fight their way from starts outside the top five. With Wienen out front and in control of the moto, there was little left that his rivals could do as the reigning champ was at the top of his game at RedBud. As Wienen dominated, the focus turned to the battle between Upperman and Natalie for second. The pair paced one another for the entirety of the moto until Upperman made a mistake on the final lap that allowed Natalie to steal away the spot. Brown was in the hunt for a podium again in Moto 2 and ultimately secured another fourth-place effort ahead of Rastrelli in fifth. After suffering early misfortune and dropping all the way to ninth, Hetrick valiantly fought his way back to sixth to ensure his spot on the overall podium. It was the third 1-1 performance of the 2014 season for Wienen and served as a fitting complement to his championship-clinching effort. Natalie’s best outing since the third round resulted in his fourth podium effort of the season in second (3-2), while Hetrick’s resiliency (2-6) helped him edge out Brown (4-4) for the third an final spot on the podium. Upperman completed the top five (7-3) for the afternoon. In addition to claiming his third consecutive AMA Pro ATV crown, Wienen also earned his third straight victory at RedBud. Wienen is the fifth rider in ATVMX history to win three championships and is just the second to ever do so consecutively, joining the sport’s most iconic figure Gary Denton, who won eight titles in a row, with that coveted distinction. With just one round remaining and the title decided, the focus shifts to thrilling battle for second in the ATVMX standings between Hetrick, Brown and Natalie. Currently, Hetrick controls second with an 11-point advantage over Brown in third. Natalie lurks in fourth, and following his extremely consistent afternoon at RedBud has closed to within 16 points of Hetrick and five points of Brown. The Mtn. Dew ATV Motocross National Championship will take a week off before bringing the 2014 season to a close with the ninth and final round from Loretta Lynn’s Ranch in Hurricane Mills, Tennessee, on August 9-10.